Just three days til Opening Night! Have you booked your tickets yet? 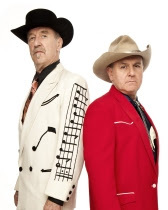 The Festival Opening Night Gala cabaret show this Friday at Bath Cricket Club is now sold out. Other shows are selling fast, so make sure to book early to avoid disappointment! Elsewhere on Opening Night, Hand Wangford & Brad Breath host an evening of tearjerkers and toetappers at Chapel Arts Centre, andJody Kamali’s One Man Variety Show airs at the GPT Smokehouse, while over at the Assembly Inn, Dave Chawner & Robyn Perkins talk about “Death, Anorexia & Other Funny Things”. Can’t wait? Choose from three pre-festival shows this Thursday at The Bell, The Porter and The Royal Oak – click here for details. 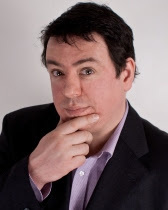 Visit www.bathcomedy.com/whats-on to view all events and book tickets online. 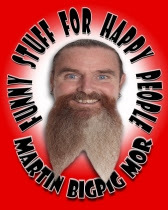 Martin Mor‘s Funny Stuff For Happy People this Sunday promises an hour of comedy, circus, storytelling, poetry and stupid science, and somewhere for kids to take their adults where they won’t get bored and go in a huff! Next Saturday, Silky Explains Parents To Children – who better than someone who sounds like a gerbil, looks like a boiled egg and has been making people laugh since before Mum and Dad were interested in beer, wine & tidying things up? The Naturals’ Studio in Widcombe is being transformed into and Edinburgh-like Festival venue for a week. With a lush red velvet stage set, cabaret seating and a licensed bar selling fine wines, Moles Beers and Handmade Cider, the studio is host to a large range of hour long shows from Sunday 30th to Friday 4th. 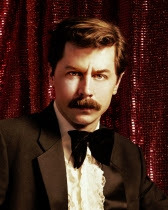 Appearing at this special venue on Sunday are: the up-and-coming and hugely likeable Scottish Comedian of the Year (and last year’s Bath New Act winner) Larry Dean, Matt Price with his amazing true story “Turkeygate, Tinky Winky & the Turkish Mafia”, and the irrepressible Martin Mor with his life affirming show, “How Do You Like Your Blue Eyed Boy Mister Death?”. Carey Marx brings his highly acclaimed and superbly crafted show about the hilarity of surviving a heart attack on Monday, followed by a visit from those devils of the denier, The Scottish Falsetto Sock Puppet Theatre. Sadly Phil Nichol has had to cancel but we’re opening the bar early onTuesday ready for the fantastic Mr John Moloney – come and see a true master at work in this lovely space. Wednesday sees the quirky ex-New Act Winner Harriet Kemsleywith her debut show, and Mike Wozniak‘s top scoring touring show – “Take The HIt”. 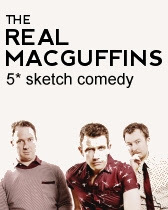 Last but not least on Friday, The Real MacGuffins are back by popular demand with their madcap 5 star sketch comedy, followed bySilky, one of the most likeable and talented performers on the circuit. Wow, what a line-up!. For full details click here to browse all the events at Natural Theatre Studio. Follow us on Facebook and Twitter – just click the images on the right.